Patrick A. McCormick always said he learned a great deal at the dining room table growing up and followed a family tradition in pursuing a career as a civil trial lawyer. His father, grandfather and uncle preceded him in the practice of law and his son and nephew continue the family’s legal legacy and are now the fourth generation of lawyers. Born in Los Angeles, Mr. McCormick lived in San Diego and La Jolla from 1971 until his death. 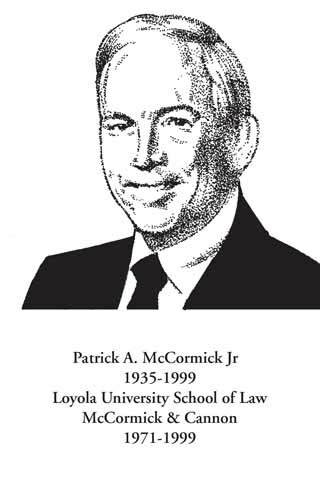 Educated at Loyola High School in Los Angeles, Stanford University and Loyola University School of Law, Mr. McCormick tried well over 200 cases to a conclusion. He served as San Diego managing partner for Rutan, Nance, McCormick and DiCaro, and as senior partner of McCormick, Royce, Grimm & Vranges, and of McCormick & Cannon during his 28 years long San Diego career. Mr. McCormick was committed to his profession as is evidenced in his numerous professional activities. He earned recognition from his peers when selected as a member of the Board of Trial Advocates where he also served as the local president of this national organization. He served as Director of the Association of Southern California Defense Counsel and was a member of the International Association of Defense Counsel. He showed his commitment to his profession upon his death when the McCormick family asked that memorial donations be directed to the San Diego County Bar Foundation resulting in several thousands of dollars being raised to help provide legal aid and access to justice to the underserved in our community. A third generation Californian, Mr. McCormick was a La Jolla resident, and enjoyed all the beach community had to offer including boating, golf and the ocean. He was so committed to the community in which he lived that he served as the vice president of the La Jolla Country Club. He is survived by his wife, Barbara; daughters Megan McCormick and Kelli Salit; sons Patrick and Kevin; and three grandchildren.